Named one of the five best places to live in the Western United States by Sunset Magazine Brea makes a perfect hometown. The city was noted for its great downtown scene. 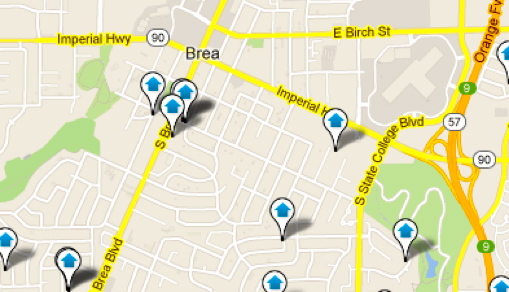 Brea homes for sale are in high demand as a part of Orange County real estate. Brea is located in northeast Orange county bordering Los Angeles County with a population of 40,000. Public art displays are scattered throughout the city with over 140 pieces in the collection, makes Brea a unique city. Brea Olinda Unified School District has six elementary schools, Brea Junior High and Brea Olinda High School. The high school’s girl’s basketball team has a won the National Championship twice and has many other award winning athletic programs. The city also has many private and religious based educational institutions including Brea Olinda Friends School, Brea Foursquare Church, Carbon Canyon Christian Church and Christ Lutheran School to name a few. Contact a North Orange County Real Estate agent for further information on the Brea Olinda Unified School District. The city of Brea features top shopping. The Brea Mall, offers fine department stores, popular retail stores and an updated food court. The Brea Promenade features a yoga studio, boutique shops, international fine dining, movie theatres and the Improv Comedy Club, a perfect place for evenings out. Every Tuesday afternoon a farmers’ market is held in the Promenade, selling fresh produce, breads, dried fruits and nuts, and hand-made crafts. The annual Brea Jazz Festival is also held at the Promenade every November. Recreation for everyone includes fifteen local parks amid the Brea homes. A large sports park is home to football, baseball and soccer fields. Ted Craig Park offers 129 acres of walking trails, equestrian trails, baseball fields and a lake. The city has two skate parks Arovista and Carbon Canyon for the thrill seeker. For calmer recreation the city provides two golf courses: Brea Creek and Birch Hills golf courses. The Boys and Girls Club holds afterschool programs for helping kids with schoolwork and provides activities in arts and sports. Brea homeowners in small housing complexes cherish the small-town feel of the neighborhoods. Brea real estate includes the Ash Street Cottages, Birch Street Loft Housing, Walnut Village Apartments and Rancho Brea Mobile Home Park. The Vintage Canyon Senior Apartments offers housing for seniors at lower rent and offer services such as transportation, group activities and wellness programs. Brea realtors can give you more details and tour the unique neighborhoods of Brea homes for sale. Brea realtors at North Orange County Real Estate can assist you with all your questions and guide you through finding Brea homes for sale or selling your own Brea home.